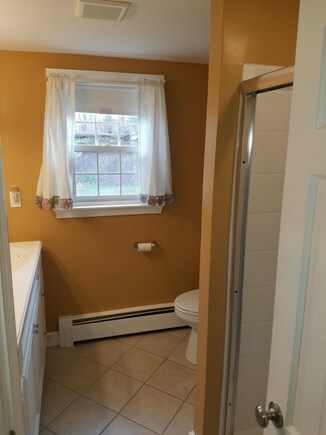 This home is the Cape Cod experience. 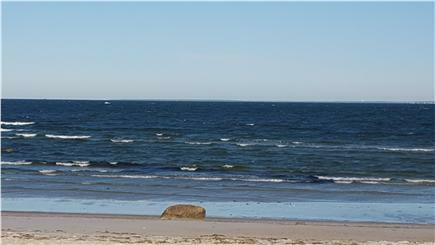 We are 6/10 of a mile from Old Silver Beach in West Falmouth where there is some of the warmest water on the Cape and the sandiest beach (no rocks).The beach has showers, snack bars and shallow sand dunes. It is a short walk or drop off from the house. At the house we have a great outside shower with changing area, a large deck with benches and table and chairs and a big grill to cook on overlooking a very large backyard for the kids. There are 5 queens, 4 fulls, 1 twin and a baby crib to accommodate sleeping for up to 14. There are 3 full baths in the house. 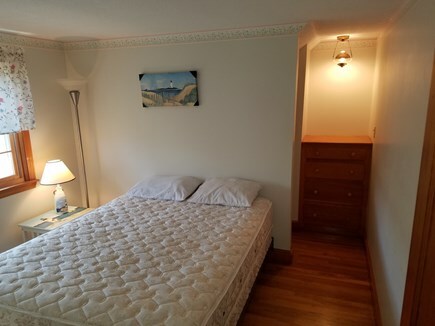 One of the queen beds and one of the bathrooms is in a studio apartment connected to the main house. The Studio apartment also has a kitchen and small living room and will be free for you to use. We have a brand new bike path behind our home. The Shining Sea Bikepath has an entrance for our neighborhood 200 yards from our house. This path will bring you all the way into Woods Hole. For entertainment at night we have an inside professional size pool/ping pong table. For those who want to maintain an exercise routine we have a treadmill, stationary bike and free weight bench set. Long-Term Rental (1 month or more): Available for monthly off season rental for $3,000 a month September through May. June can be rented for $5,000. Additional pricing info: Owner special 2000 for week of 7/9, State and local taxes of 12.45% will apply. 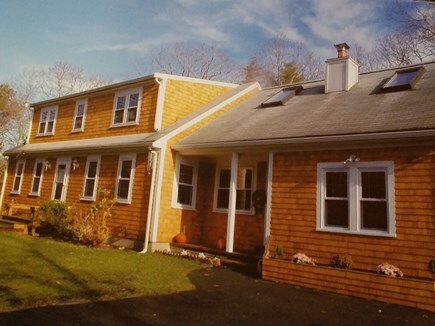 I rented this lovely home in West Falmouth, a short distance from a lovely beach for a week in September. I met my son and my daughter there. They both came from other cities with their significant others and my one grandchild. I also brought my two dogs. The house was wonderful: very roomy, with a slider in the dining room opening up to the yard in the back where we could have dinner on the deck . The kitchen was well stocked and very comfortable. We had use of the laundry facilities and there was also a dishwasher. This was a great place to stay for a family reunion. We were 10 adults and 2 small children. The other reviews are accurate. The owner is really responsive and easy to deal with, and the house was clean and close to everything we needed. With air conditioners on and house closed up, it cooled down fine for a good night's sleep. We all said we would stay here again. 1. There is a good wifi and cable for working (if you need to) or general entertainment. 2. 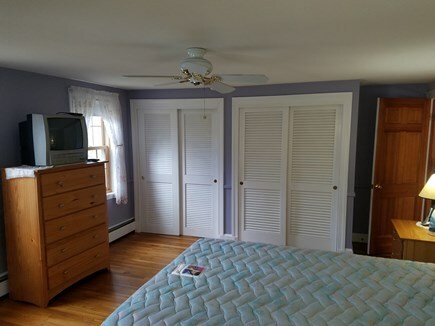 There is a window AC unit in the living room if it's hot (and it was for us), but not every bedroom has AC. There are fans in each of those rooms though. 3. 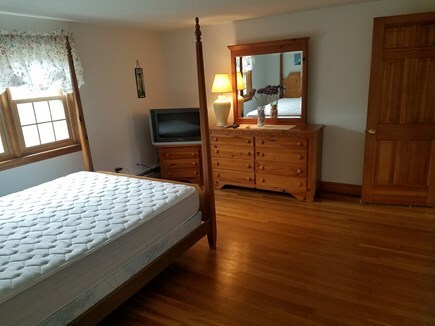 It was not clear from the listing, but one of the largest bedrooms upstairs with three beds is only reachable by walking through one of the smaller bedrooms (with a queen). Be sure this setup works for you (like parents in the first room and kids in the back room). 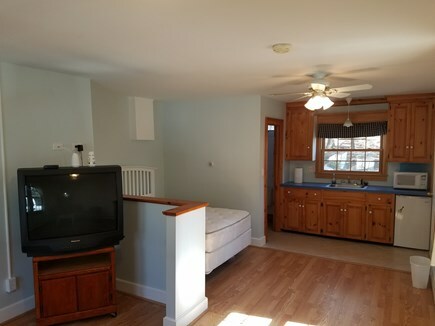 If you have a group of friends using those two rooms, it would be awkward to have to walk through one bedroom to get to the other and kills the privacy of both rooms. 4. 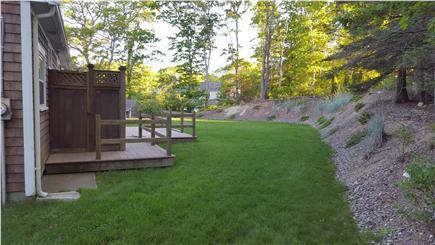 The yard is huge, both front and back, and offers plenty of privacy. Great for letting kids run around while you lounge on the back deck. 5. The bedroom in the separate apartment with its own bathroom is nice. Plan to have people fighting over who gets it. 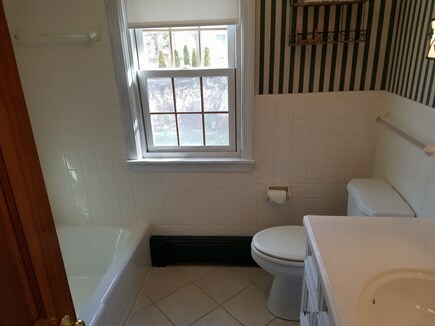 This is the third bathroom though, so effectively the main house has two bathrooms, one up and one down. 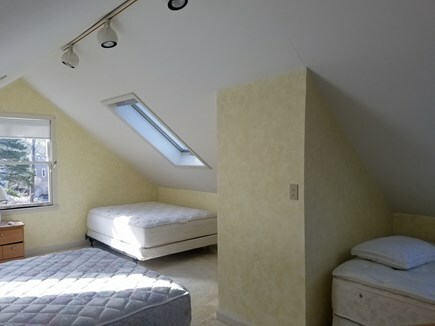 This means all four bedrooms upstairs share a single bathroom. 6. Old Silver Beach is great and is walkable in about 15-20 minutes. Parking there is tough, so plan to walk or shuttle people if you stay here. 7. 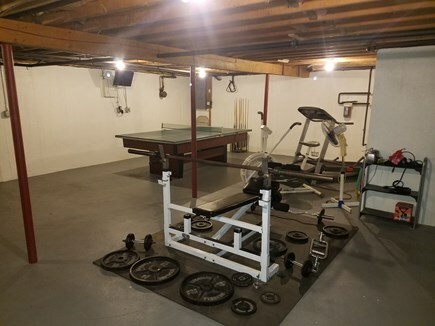 The basement has a pool/ping pong table combo and an extra fridge. Very useful. Comfortable vacation home for large family in great location! We rented this home for two weeks and enjoyed every day there. This home was the perfect size and location for four families to gather, celebrate and see the Cape. Only 1/2 mile from Old Silver Beach and closer yet to Shining Sea Bike Path. Each family could choose what to do and when it was best for them. It had a great yard for our seven grand kids to run, play Badmnton and Whiffle Ball. The Pool/Ping Pong Table in the basement became a gathering point each evening for adults where we could laugh and visit without waking sleeping children. 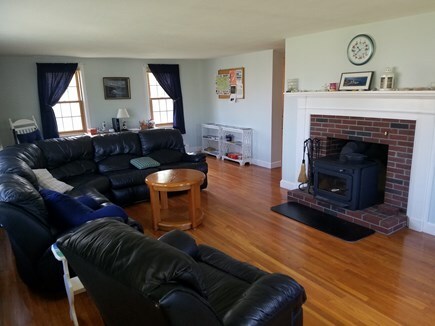 Our family loved our week at this spacious and well located Falmouth home. 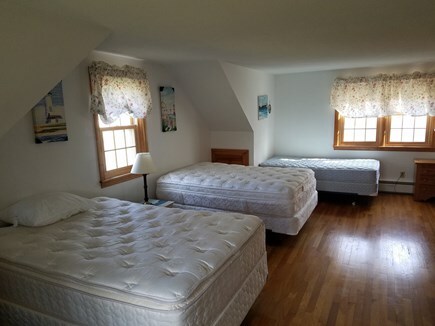 The rooms were extremely comfortable with lots of room for the three families vacationing together. 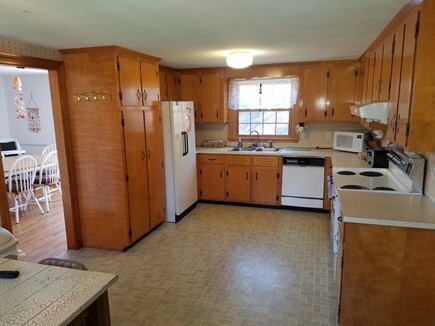 Large, well equipped kitchen, great living room that accommodated all of us and a wonderful yard for the kids to play. Easy walk or bike ride to the beach and the bike path just up the street. Erick was wonderful...always available to help with any questions. Loved this home! Hello my name is Erick. I own this home with my brother. We rent this home now but we have spent many summers at this property vacationing ourselves. 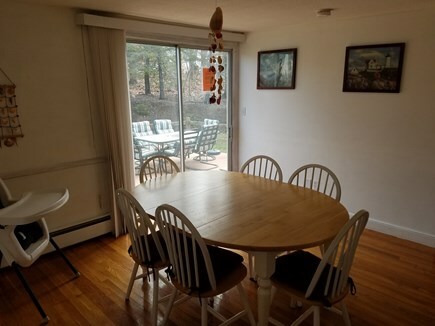 I am a contractor and try to keep the property in good shape.We do constant checks on the property and are there every week to make sure it is clean and functional for everyone to enjoy from one rental to the next. I think there are 2 great assets to this property. One being the great beach that is 6/10 of a mile up the road. The second being the bike path yards away from our driveway that travels directly to woods hole. The town itself is a nice quiet town. It's only 15 min over the Bourne Bridge and yet is still close to Plymouth and only an hour away from Boston. Many things to do in this area.